Behold! I actually baked something pretty darn cute. Now, I love to cook. I don't do anything fancy, but when I have the time and the energy, I really do enjoy cooking up a good meal. Baking, however, is not my thing. Sure, I have mastered the Ghirardelli boxed brownie. But anything I've ever attempted to bake and make pretty? Total failure. I'm a perfectionist and I lose my patience. Seriously, nothing amazes me more than those of you that can decorate picture-perfect cakes and cookies. I am in awe and green with talent-envy! I've accepted that I will never master this craft. So if I need exceptional looking cakes or cookies, I pay someone else to do it. My mom was not a baker either - even less so than me. So I did not grow up around it. I can vividly remember going to a friend's house in junior high and going into the kitchen to find her mother taking a fresh batch of cookies out of the oven. Heavens! Cookies out of the oven?! I thought those only came in boxes from Kroger! BUT! While I'm not an avid baker, once in a blue moon I'll decide to give something a try if it looks easy enough. Last week we had our monthly neighborhood bunco game and for whatever reason, I decided to make cupcakes. 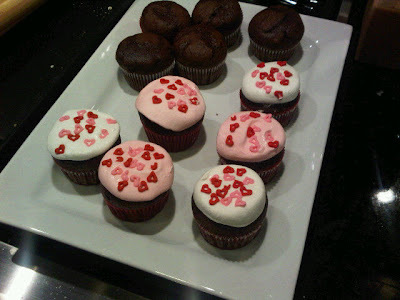 The only cupcakes I usually make require no frosting. Frosting anything scares the hell out of me. I cannot tackle frosting to save my life. If you can successfully frost a cake, you are light years ahead of me. I think I could handle the tube kind where you just whip it around all swirly-like on top. But that would require making frosting and also baking supplies I don't own. No thanks. That all sounds really messy. It was so easy peasy - even for me. Just grab a box of your favorite cake mix (or if you're the do-it-from-scratch type, more power to you). Bake standard size cupcakes according to box direction and set aside to cool. For the frosting, you'll need the jumbo marshmallows (one for each cupcake) and any sprinkles/confetti you want to top it with. I used the standard white and the strawberry pink marshmallows for Valentine's Day! 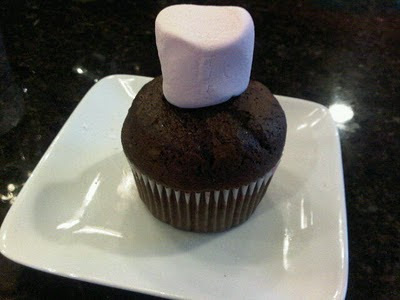 For the marshmallow topping, top one cupcake with one jumbo marshmallow and microwave for about 15 seconds. If it falls off while nuking, no big. You are only microwaving it long enough for the marshmallow innards to get gooey. You don't want the whole thing to burst open. As soon as you see it just begin to swell, it's done. Immediately after removing from the microwave, gently mash the marshmallow down and it should easily spread over the top of the cupcake. If it's being stubborn, nuke it for a few more seconds. But it should easily go down and allow you to "mold" it the way you want it without getting sticky. Top with sprinkles, etc. and viola! I've also seen recipes on how to do this in the oven but that scared the hell out of me. It involved broiling and I would surely set our house on fire. So yeah, three cheers for my pretty cupcakes! Glad to have these in my back pocket if I ever feel the need to bake something cute. As I said on Twitter, LOVE the way these look - SO cute! 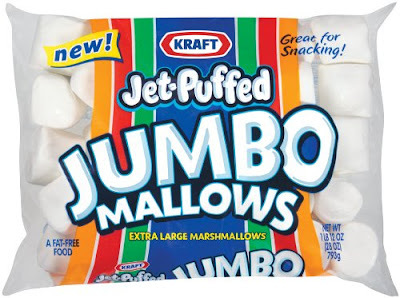 My only question, are they hard to eat once the marshmallow cools or does it return to the consistency of a soft marshallow? No, they're still "mushy" after they cool. I made the hub try one long after they cooled and he said they were great! So glad you tried this- I posted about it on my blog a few months ago but hadn't had a chance to try it- it looks so much with your pink mallows! I've seen a similar thing done but just a minute before youtake the cupcakes out of the oven, you pop a marshmallow on top of each. And then they get toasty on top too. I've never done it but have seen it on a few blogs. Actually I just made a batch of homemade marshmallows. I should have sent S a bunch because I only use about 5 of them and they make a ton. What a great and easy idea! I'll have to remember that one! WOW...love, love, love this idea!!! Hope you have a very happy Wednesday!